“Many insist nothing beats the flicker and crackle of a wood fire. 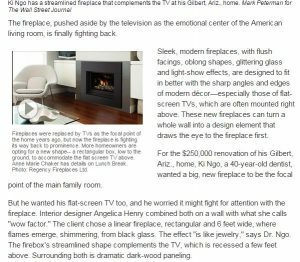 But the gas fireplace, which entered the market about 25 years ago, has become mainstream by offering the ease of push-button ignition and less mess. In its early years, the gas flame often looked “too blue,” says Mike Pennington, vice president of engineering and product development at Lennox Hearth Products, a unit of Innovative Hearth Products. Today, technology has evolved to create a gas fire that is practically indistinguishable from a wood-burning fire. “Dancing, billowy, yellow flames are typically the target,” he says. With a huge variety of vented and vent-less gas logs available at our gas log showroom, you can select the perfect set of gas logs for your home. The elegance and design of a gas fireplace will bring beauty to your home for many years, with little maintenance required. At Berico, our experienced technicians will inspect your vent duct to make sure it is safe, and provide a comprehensive installation of the gas log kit, compliant with local regulations and ordinances. We even include a demonstration of how to use your new kit, along with an overview of best practices regarding your natural gas or propane heating. Call us to find out about the variety of sizes and designs that we have available for your new gas log kit: (336) 496-2509.